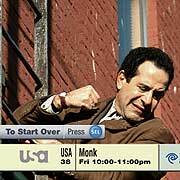 Time Warner is hooking up with NBC Universal to launch a new service called "Start Over" . With the new service, digital cable customers who miss the beginning of selected shows, can push a button and go back to the start- provided they've tuned in before the end. Here's the catch: viewers also can pause and rewind the show — but can't fast-forward through commercials. NBC shows participating in the trial include The West Wing, Law & Order: SVU and The Tonight Show with Jay Leno. A trial will be launched next month in Columbia, S.C.